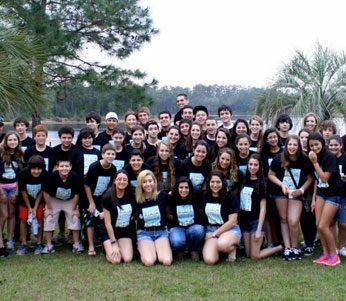 Perfect school group retreat location in Florida for your grade, middle or high school’s next class trip. A serene 100-acre retreat center that also serves as a premier children’s summer camp. A serene location close to Gainesville and just outside the Ocala National Forest that sits on the pristine shores of our private spring-fed lake. Canoeing, paddle boating, or kayaking are a few of many possible outdoor activities that the school kids will love. We have wide open sports fields for team games as well as indoor/outdoor basketball courts and four tennis courts perfect for school group retreat activities. We can also arrange facilitation of our high and low ropes courses to meet your school group or school’s leadership development/team building needs. Your school’s group will have exclusive access and will be the only group using the entire location during the event. All meals are provided by our retreat center staff. There are a number of meeting rooms of different sizes that can be used for lectures, break-out sessions, or even crafting. There is a theater and lecture room, equipped with an overhead projector for movies or presentations. All buildings are air conditioned. for info on availability and all inclusive pricing for your grade school, middle school or high school’s next weekend or full week group retreat in Florida!